God’s Will: Prospering in All Areas of Your Life! Something that is crystal clear in the context of God’s will for your life is that He wants you to follow His ways so that you will be blessed and prosper at all you put your hand to. This won’t happen overnight but it is God’s will and this is crystal clear in the context of the entire Bible. Ignorance of God’s will, will open you to attack. Satan loves when Christians believe that the adversity he creates, is from God! He loves that God gets the blame. He loves it even more when ministers of the gospel ignorantly teach it. Hosea 4:6 (NKJV) says, “My people are destroyed for lack of knowledge…” So let’s get this straight, God wants to bless you! In 3 John 1:2 NKJV we read, “Beloved, I pray that you may prosper in all things and be in health, just as your soul prospers.” In this verse, the word “prosper” means: to get help on your journey, to succeed in the business of what you put your hand to. The Holy Spirit inspired this verse, which means, its God’s will that you prosper in your journey through life at what you put your hand to for the Lord. And it is His will through His grace, to help you in that journey! His grace is His supernatural mercy and help! There are many things that contribute to prospering according to the word of God such as love, planning, preparation, diligence, faithfulness, steadfastness, integrity, the development of character, and so on. Many Bible verses speak to this, so as we conduct our daily lives and business, we must mature in these godly character traits. As we do, the maturity of these qualities, coupled with the grace of God, will lead us to mature and prosper in all we put our hand to for Him! that the LORD was with him (Joseph) and that the LORD made all he did to prosper in his hand.” Joseph walked in those godly attributes and in the favor of God, and God prospered him through His maturity and God’s grace. Deuteronomy 29:9 (NLT) says, “Therefore, obey the terms of this covenant so that you will prosper in everything you do.” God wants us to prosper in whatever we do so that we may glorify Him and be equipped to help accomplished His will in the earth—not only concerning the gospel and showing His love, but in invention, innovation, and all that benefits and blesses mankind! We all know the world is full of sickness. It’s the consequence of sin and has infected the entire earth. That is no way to say that if anyone is sick, it’s because they sinned. I am saying that sin has led to sickness and disease permeating the fabric of every living thing like an air-borne virus. Satan’s touch upon this earth is sin, sickness, and destruction. But, when people see sickness and disease, some ignorantly question, Is this God’s will? Is God doing this to me? Some ignorantly teach Yes. The answer it not yes. It’s an absolute no! How do I know? Just look to Jesus. Jesus said, “If you have seen me, you have seen the Father.” He and His Father are on the same page! His will was and is to heal. Jesus said, ‘When you pray, pray Your will be done on earth AS IT IS IN HEAVEN.” There will be no sickness in Heaven. Revelation 21:4 says there will be “no more death, sorrow, crying, or pain.” So when you pray, know that good health is God’s will. It’s up to you to cooperate with the things that promote good health such as nutrition and exercise, but from there, lean on God’s grace through faith and pray for His healing touch upon your life. Never give up, get weary, or cave in to what you know is not God’s will. Don’t look to someone dying and say, They died so it much be God’s will. Death is in the earth. It will eventually touch us all. But even then, in less than an eye-blink, every believer will receive eternal life so that the scripture says, “Oh death, where is thy sting?” So stand against it and pray for God’s will despite circumstances. And remember that God can heal miraculously and instantly, or in time, or through the hands of the medical profession who are agents of the grace of God whether they know it or not! But stay in faith for His will regardless! 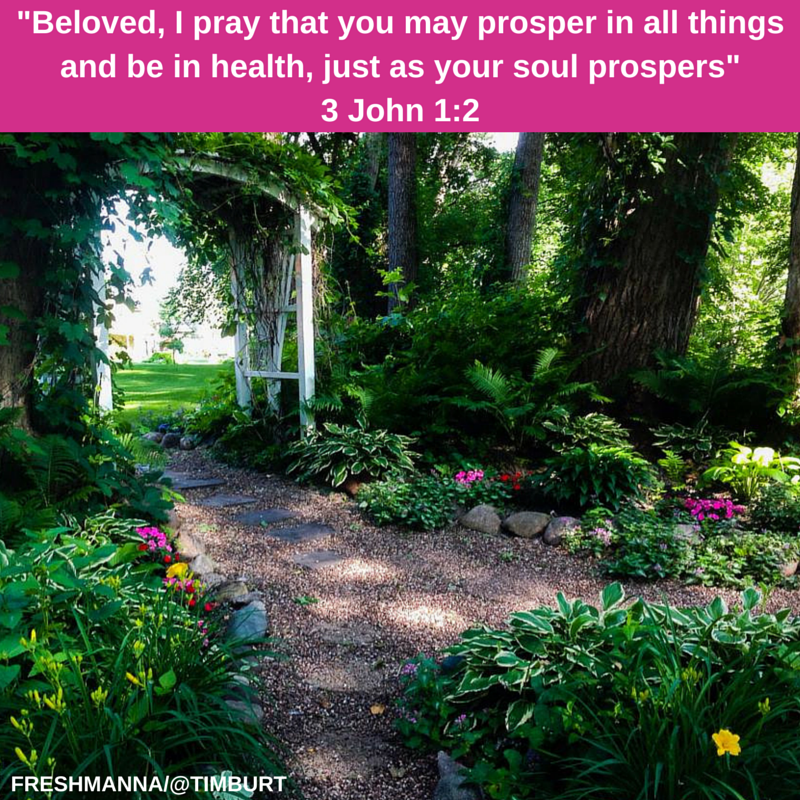 Finally, 3 John 1:2 NKJV says, “Beloved, I pray that you may prosper in all things and be in health, JUST AS YOUR SOUL PROSPERS.” What does it mean for your soul to prosper? Your soul is made up of your mind and emotions. Your mind and emotions are trained one of two ways: The first way and wrong way is, haphazardly through the bombardment of life! Your mind and emotions think on and believe and react to the ever-changing circumstances and sources of information, evil reports, and negative information that hits your life each day. The second and right way your mind and emotions are trained, is by you learning and believing and anchoring your thoughts an d emotions in God’s word, His promises, and His will for your life, regardless of present circumstance. Meditating on these things keeps you rooted and stable, and strengthened in your faith. The result: “…prospering in all things and being in health, just as your soul prospers.” So anchor your life in God’s will, mature in character, and prosper at all you put your hand to!